As-salamu alaykum and hello everyone ♡ . How has Chapter 2 of the year been going for you guys? 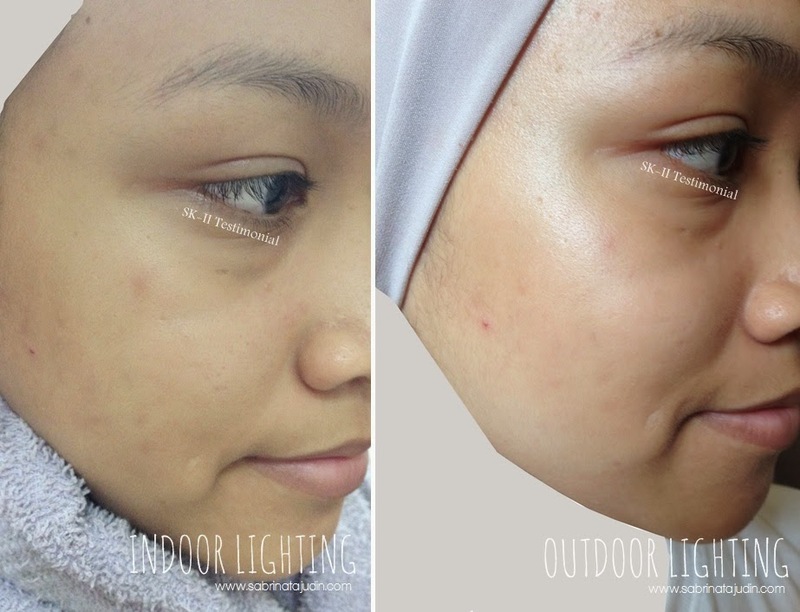 Have you seen my previous post on my SK-II journey? I am going to give you a full insight of my journey with this miracle water. Many have said that this Pitera essence works miracles for them. If you don't know what Pitera Essence is, you can check out my first introduction post here, (link) and how I got my skin analyzed for problems here, (link). So I have been using this since the 1st of January, as part of my resolution to keep my skin better. Since this is a Holy Grail product to most women out there, I am going to give this miracle water a shot. So I changed my skincare routine for the purpose of this product. I cleanse my face using a facial cleanser, just switching from one to another (from a mild scrubbing one and a foaming one) and then I pat dry my face. This is where my SK-II routine starts. I start with the toner (the one in the small bottle), wiping my face using cotton pads and then use the essence just like a toner since the texture of this miracle water is watery. First impression. This essence Well, first thing I notice that 3–4 drops of this is fairly enough to cover the entire face, but I like to use 4–5 drops just to make my cotton pads more moist. Second, yes I got to admit it since I am very picky with my skin care scent. This Miracle water does have a slightly sour scent to it. I am still new to this, we will see if I can get over the smell later. It is not too strong but you can smell it after wiping your face. It absorbs fast and your skin can feel a lil sticky for a few seconds and then your skin soon feels supple! I am not lying! During my lazy days, I kind of skip my moisturizer routine. After cleansing, I just wipe my face using this essence and I feel good to go. I have not used the mask yet, I am going to use it after 1 month or so. Yep, there will be a final post on my whole verdict on this product. 14 days to me is too short to claim its "miracle" power so stay tuned for another post. Disclaimer. This picture is not edited. There have not been any editing with lights or any skin clearing editing. I am showing my true skin both BEFORE & AFTER. The pictures are taken at the same location, same timing, same lighting and camera. Yes, this is my bare skin after cleansing. My thoughts after 14 days. WOAH to my bare skin. Haha. I don't know if you can tell but there is a different skin tone to both pictures. I have tried to take so many pictures but all of them turn out the same. 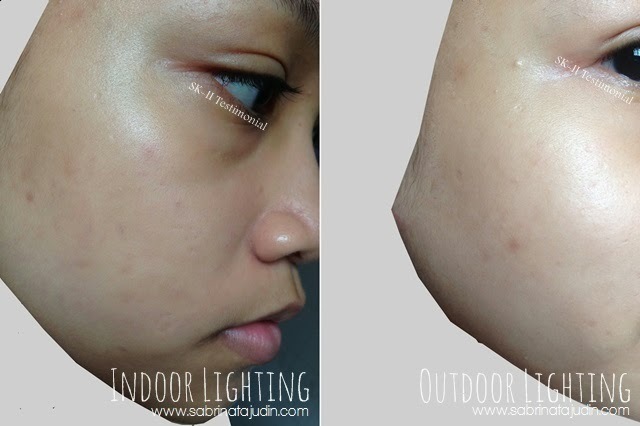 I am not sure if skincare can make your skin look better in camera? Probably, because I find after using this essence, every time I took a selfie, my skin is brighter. Also you guys know that having nice skin is not about being fairer. Clear pretty skin is about having that translucent clean skin which looks like you have this soft textured skin and visible fair skin. Too much glow and yellowish skin tone can make you look dull. After 14 days of using it, I can't really show in the picture but I feel my skin is less oily, or maybe not oily anymore. Like seriously and I am not trying to hard sell this product. When I woke up in the morning, my skin is not oily, not over hydrated (sticky face) and my face is brighter. Especially on my forehead, it looks so obvious because I have a big forehead and it really gives that nice glow on my skin. What I cannot see is that my spots are pretty much the same but my redness has been totally reduced. Foundation and makeup application in the morning is easier. My skin is smoother; there are some pores but they’re not that obvious. My skin is a little firmer too. Overall, I think I have to give this more days of testing to see the final result. I will also practice good diet and healthy living. I have been stressed for the past week because of my Final Year Presentation. I hope I can continue using this with a good lifestyle and see how this will make my skin healthier. See you next on my next post on healthy eating and my skincare routine (deeper explanation on my routine)! What do you think of my after skin after Facial Treatment Essence? This has been on my radar for a while now. Still searching for the best skincare regime for my oily, acne prone skin. And you skin does looked glowy now! I couldn't agree more that having fair skin is not everything and can actually make our face looking flat but having healthy and even skin surface is the main concern to me. p/s: I laughed so hard at the "because I have big forehead". haha! true..embrace ur teue skin color..yg penting even toned, tak perlu nk putih and ubah ape yg diberi kpd kita..nmpak mcm makin glowy..sblm tu nmpak kusam sikit..akk pun pernah pakai ni ms kat malaysia dulu..tp kt sini SKII takde..
sumber nya beras... bg sab mmg byk khasiat beras ni. sebab cuba tgk tapak tgn kita, sab masak nasi hari2.. mmg beza kot tapak tgn sab ngan bahagian lain. hehe... alhamdulilah.. Considering switching to SKII next year so thanks for the post. I'm trying to read up as much as I can before that. But there's a definite difference in those pics. All the best with the rest of the journey! Previously I've been using SKII for 3 years plus before I change to other product (Biotherm, Sothys etc). My first purchase from SKII was trial set, consist of 3 main products (cleanser, toner, essence). If I'm not mistaken the price was RM98 back in 2004/05! Hihi. Time tu memang ada few people tanya product ape I guna. I got less pimples and scars. So I guess memang berkesan la kan.
ya, bio essence is also nice! right now im really loving the facial treatment essence! I just started using this particular essence for two days now. I know it's too soon to tell, but I does notice that my skin is slightly brighter and has a glow. But one thing I dislike is that my skin gets oily after overnight application (maybe I use too many?) I apply directly using my palm around 4-5 drops as well. Do you somehow experience the same thing(oily skin) during your early days of using it?..but it doesn't oily during the day though. oh, i use 4-5 drop using cotton pads. yes, i have once try applying using my palm with the same amount and i feel the stickiness. if you wanna apply with your hand, try using 2-3 drops. and from my experience i like using cotton pads better. i don't feel oily when using this, maybe i apply it using cotton pads, so the perfect amount of essence is spread on my face. Salam dear.. Akak pun dapat result yg sama selepas 2 minggu tp akak guna once daily before tido.. Muka memang less oily, brighter, redness berkurang..
Wslm.. ^_^ yep, yg paling significant is less oily. mmg dapat rasa! I am in love with these shades; those are awesome and stunning shades especially that reddish brown one. apa ini cocok buat umur 17 tahun? ouh my..nmpaj perubahan yg sgt better.. gotta buy it today..tapi nk trial set dulu.. bape hargonyo for trial ? ?